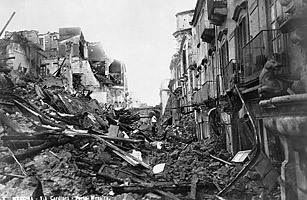 By today's standards, the earthquake that struck beneath the Messina Strait  which separates the regions of Sicily and Calabria  on December 28, 1908, was a magnitude 7.5. A subsequent tsunami sent waves as much as 40 feet high crashing into the Italian coast. More than 80,000 people were killed and dozens of towns destroyed. Refugees from Messina were relocated to cities throughout Italy. Many were eventually transported to North America, aboard ships like the Florida  which, before reaching New York City, collided with another vessel, killing three already traumatized Italian passengers.